The history of Capoeira does have its begin somewhere in the second half of the 16th century. The Portuguese, having an urge for cheap and reliable work-force, start importing African slaves to their South American colonies. They tried to use indigenous people first, but those were either running away, hiding deep in the jungles of the Amazonas, or were dying away like flies, because they were not resistent against “Old World” diseases. Africans were immune to them, and ripped away from their homes several thousand miles across the ocean, they seemed to be more feasible work-force. Slavery and Oppression will always lead to resistance. And slaves did try to resist. First they just fled. One by one or in small groups slaves tried to run into the woods and survive in an unknown environment. Some did, and started settlements. And once having settlements, they started to grow. With growth comes strength and at a certain time former slaves started acting with self-confidence, fighting and trading with slave-owners. Those settlements were called Quilombos, the most prominent and biggest example being the Quilombo of Palmares, existing for about 100 years until it was destroyed by Portuguese troops in 1694. The people living in the quilombos established guerilla tactics to deceive and defend themselves against those who did want to extinguish them. Quilombos did exist till the 20th century and there are still some cities which have been Quilombos originally. But the important times were the times of the Quilombo dos Palmares. Traditional Capoeiristas see themselves as true heirs of the legendary heroes Ganga Zumba and Zumbi (the leaders of the Quilombo dos Palmares), although nobody does know if they did do something similar to Capoeira. But their will to resist against a seemingly too powerful enemy and their will to live their way – those elements are still remaining in today´s Capoeira. After the abolition 1888 the status of the former slaves did not change much. A lot gained official freedom, but if they wanted work they had the choice to submit themselves into slave-like work, be unemployed and starve to death or find a way for themselves. A lot of former slaves went into the cities where they found work at the docks. In there past-time they did practice Capoeira. But those days Capoeira was much more diverse than today´s, and much more violent. This and the fact that people did not like poor Blacks to become competent fighter led to Capoeira being outlawed by Constitution in 1890. Even before people did not like their slaves to practise a martial art. After 1890 police did heavily cut down on Capoeiristas. Especially the more violent forms of Capoeira in Rio de Janeiro and Recife were heavily persecuted. 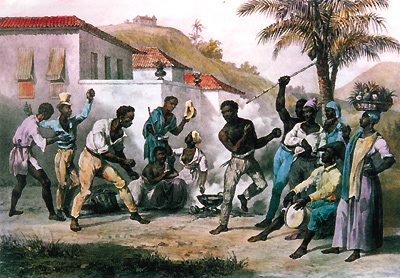 Even those practising a more dance-like form of Capoeira in Bahia did have problems with the police. But they had, seemingly, the least problems with the police, because by 1930 there were not many Capoeiristas left, and those that were were mostly in Salvador, Bahia. In those years, a Capoeira Master named Mestre Bimba, did have several concerns about his Capoeira. He did not like the efficiency of the heavily dance-influenced Capoeira. On the other side, violent forms of Capoeira were openly disliked by the government. In giving Capoeira a ‘regulation’, getting it off the streets into his school, Bimba did save Capoeira. The new sport he named “Luta Regional da Bahia”, now known as Capoeira Regional. Only this form made it possible to have Capoeira accepted officially. Only with Bimbas idea Capoeira was legalized in 1937, when a heavily impressed president Vargas did see a ‘truly Brazilian sport’ in Capoeira. Vargas was heavily influenced by fascist ideas, so one might ask if it is really a good idea to get his blessings for this. But MEstre Bimba had no choice. First of all, he was personally taken by the police to the president and they wanted him to perform his ‘ Luta Regional’ and second, Mestre Bimba was most possibly fed up with the shadow existence a Capoeirista has. He did introduce Capoeira into those parts of the population, which were not poor or/and Black. The white people, the richer middle- and higher class boys. After this Capoeira Regional did gain huge popularity in Brazil (though even today there is still some prejudice against Capoeira as being something for A) guys B) rough boys C) Blacks D) poor people). Schools popped up everywhere and in the 1960’s a group of young teachers founded the Senzala group. Capoeira in these times did gain a regular and standardized training system, a cord system and a lot of students. But it lost a lot by this. It lost a lot in terms of its rituals, its playfulness, its mucic, its malicia, its Africanity in general. It became a more and more European sport. As there were more Mestres other than Mestre Bimba, Mestres who did know the old Capoeira, a inner-Capoeira resistance movement did start. Mestre Pastinha is something like the head figure of this movement. He was not the oldest of the traditional Mestres, he may also not have been the best, but he had the right combination of knowledge, skill, intelligence and charisma to gather and teach some of the best Capoeiristas. And he did, in comparison to his colleague Bimba´s Capoeira Regional, call this Capoeira Angola ‘because it comes from Angola’. Till the 1980s and until the death of Mestre Pastinha this traditional Capoeira was a shadow of Capoeira Regional, gaining most of its strength from its contradiction to Capoeira Regional, being teased by Regionalistas as the slow, old men’s capoeira. This all changed since the 1980 with the efforts of students of Mestre Pastinha. With the two great Capoeiristas Mestre Joao Pequeno and Mestre Joao Grande. They were the symbolical leaders of the revival tour of Capoeira Angola. Those who did invest a lot of work into this were definitely Mestre Moraes and Mestre Cobra Mansa (among others, and believe me, I would like to count them all, but I know that every list will be incomplete). Since then Capoeira Angola did evolve a lot, has shown many facettes of its beauty and has gained its own strength (not depending on its contradiction to Regional, anymore). Together with this development Capoeira started to seriously go international. Of course the first groups being set in the U.S. and Europe were Regional groups in the 60´s and 70´s. Capoeira Angola started to show up outside Brazil in the 1980´s and only since the 1990´s it started to spread around. By this modern Capoeira started to evolve as an own form. Modern Capoeira is heavily influenced by the Senzala style (which is influenced by Mestre Bimbas teaching methods), but did incorporate more acrobactics, other martial arts and also Capoeira Angola techniques. Thus leading to a highly diverse scene of different groups all practising something they call Capoeira Contemporeana. So today there are three Capoeiras (at least): Capoeira Regional (like it was taught by Mestre Bimba), Capoeira Angola (heavily influenced by Mestre Pastinha) and Capoeira Contemporeana (which is the Capoeira most people know). I really liked this blog and info about capoeira! I really feel sometimes some people ( practioners of capoeira that are not of African descent) really don’t like to acknowledge the fact that Capoeira was developed by Africans and African descendants. I agree that a lot of Capoeira schools have really taken the Africanity out of Capoeira. Many teachers try to make it all about kicks, takedowns, florieos etc…when I see capoeira as being so much more. I believe that the study of any art includes the study of the whole art itself and not just one one particular area. I think a good capoeirista teacher should have a knowledge of all three so called styles of capoeira! I say thank you very much. Your information has been most helpful. I as of yet have only dabbled in capoeira, but I have a full Afrikan appreciation for it. I’m personally partial to Angola as well. Three quick points, 1) after the spirit is gone it is only a dance 2) often times we see as Afrikan people the same thing with Afrikan drumming, if there is no interest from Afrikan people others will have to do 3) “if your politics don’t dictate your economics than your economics will dictate your politics.